Colombo, January 29: Stepping up its efforts in boosting development and infrastructure aid to its southern neighbour Sri Lanka, India in a latest has constructed two new schools in Jaffna. With this move, the two countries have fortified their relations in the educational infrastructure development. Two new school buildings in Navatkuli and Chavakachcheri of northern Jaffna District which was constructed with Indian assistance were handed over to Sri Lanka on Monday. 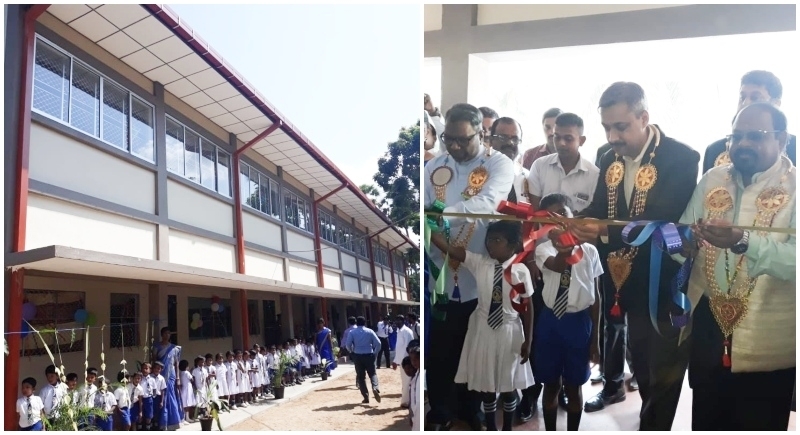 The school buildings, in Navatkuli Mahavidyalam and Drieberg College, were jointly inaugurated by the Indian Deputy High Commissioner to Sri Lanka Dr. Shilpak Ambule and the Governor of the Northern Province Dr Suren Raghavan. These school buildings are part of new classroom buildings currently being constructed in overall 27 schools in the Northern Province at a cost of 250 million Sri Lankan Rupees. Ten school buildings have been completed and inaugurated including the other two buildings handed over on Monday. Deputy High Commissioner Ambule urged the youth to seize available opportunities and translate them into achievements. The youth have the onerous responsibility of taking the nation forward to its befitting place in the comity of nations, he remarked. He also highlighted the people-oriented development cooperation projects undertaken by the Government of India in the region. Besides, various projects undertaken in the field of rehabilitation and resettlement, the Government of India has constructed a total of 46,000 houses in the Northern region. Emergency Ambulance Services are operational in a total of eight provinces including the Northern Province.